The Hug-A-Tree and Survive program is designed to teach children ages 5-12 how to keep from getting lost, what to do if they become lost, how to stay warm and dry, and how they can help searchers to find them. The program originated in San Diego, California, following the tragic death of a nine-year-old boy who had become lost in the woods. Once you know you are lost, hug a tree! One of the greatest fears many of us have is being alone. Hugging a tree or other stationary object and even talking to it can help calm you down, and prevent panic. And most important, a tree can provide you with valuable shelter. By staying in one place, you will be found far more quickly, and won’t be injured in a fall. Whenever you go hiking, you should carry a whistle on a lanyard around your neck and a trash bag. By making a hole in the side of the bag (so you don’t suffocate!) for your face, and putting it over your head, it will keep you dry and warm. The whistle can be heard from farther away than your voice, even when you are yelling very loudly. And it takes less energy to use. Time and again, children have avoided searchers because they were ashamed of getting lost, and afraid of punishment. Anyone can become lost, even adults! So don’t be ashamed. Just admit it, accept it and take actions to be comfortable while you wait for the searchers to arrive. Your parents will be so happy to see you again, and to know that you are safe. So there’s no need to be frightened or worried about that. And they will be so proud of you for using your head since it is your best survival tool. From a helicopter or airplane, people are hard to see when they are standing up, when they are in a group of trees, or wearing dark clothing. Find your tree to hug near a small clearing if possible. Wear a brightly colored jacket (red and orange are easy to see from far away) when you go into the woods or the desert. Lie down when the helicopter flies over. If it is cold and you are rested, make a large cross (X) or an “SOS” using broken twigs, branches, or rocks, or by dragging your foot in the dirt. If you hear a noise at night, yell at it! If it is an animal it will run away to protect itself, and it it’s a searcher, you will be found. Many children who are lost don’t realize that if they will just sit down and stay put, one of the many searchers will find them. The searchers will be yelling your name, but they are not angry. They are just worried about you and want to find you as quickly as possible. Don’t be afraid to let them know where you are. West Valley Search and Rescue regularly presents the Hug a Tree and Survive Program to local elementary schools, scouts, and other youth organizations. There is no cost to participate in the program, and all class participants receive a free emergency whistle and a program manual/coloring book. Each presentation concludes with an open question and answer session. If you would like to schedule a Hug-a-Tree and Survive Program presentation for your organization, please e-mail us at westvalleysar@westvalleysar.org. 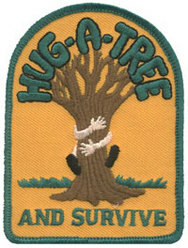 For additional information on the Hug-A-Tree and Survive Program, including downloadable program materials such as the coloring book and a parent’s guide to the program, please visit the National Association for Search and Rescue (NASAR) Hug-A-Tree and Survive Program website here. On a Saturday in February of 1981, three brothers were together on Palomar Mountain, 60 miles northeast of San Diego. They were walking on a popular nature trail a half-mile from the camp where their parents were preparing lunch. Two of the brothers believed that the nine-year-old was racing them back to camp, but Jimmy Beveridge never arrived. The family spent one hour searching on their own before contacting a Park Ranger who in turn contacted the Sheriffs Office. By late afternoon, the local sheriff’s helicopter arrived, Sheriff’s Reserve Search & Rescue personnel were beginning to assemble and members of the San Diego Mountain Rescue Team arrived. The official search had begun and quickly escalated as operations continued into the night. As is often the case in February in Southern California, the weather was unpredictable. Saturday had dawned beautifully clear. It was warm in the sun and cool enough for a jacket in the shade. There were still patches of snow in the areas the sun didn’t reach. As nightfall approached, clouds and fog moved in and the temperature steadily dropped. By Monday, it was raining almost continuously and fog continued to shroud the mountain top. The helicopters could fly only when the cloud ceiling retreated, which was rare on this day. The wind and rain had neutralized Jimmy’s scent, so tracking dogs were of no use. The only hope was to systematically search the entire area, and pray for a sign of the boy. Tuesday morning the weather broke and the sun came out. There were about 400 searchers on the scene, including 200 marines. That afternoon the boy’s jacket and one shoe were recovered and his direction of travel was finally established. Wednesday morning Jimmy’s body was found, curled up next to a tree in a ravine about two miles from the campground. He had died from hypothermia. The tragedy gnawed at Ab Taylor, a professional tracker for the U.S. Border Patrol, and Tom Jacobs, a free-lance photographer. Both had been members of the search teams that worked tirelessly to find Jimmy. It was the first time in Mr. Taylor’s thirty-one years as a tracker that he had failed to find a missing child alive, and the experience prompted him to enlist Tom Jacob’s collaboration in establishing Project Hug-a-Tree-a program aimed at teaching youngsters what to do if they’re lost. Following the article in Woman’s Day magazine in 1982, several thousand letters were received requesting further information and expansion of the program outside of California. Today, thousands of Hug-a-Tree and Survive programs have been taught across the United States, Canada, and in several other countries around the world.